Join Author Leesa Rowland on her Virtual Book Tour starting August 10th, sponsored by The YP Publishing. Why do some people walk into a room and instantly command everyone’s attention and admiration, while others go unnoticed? 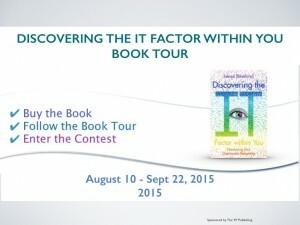 PRIZES 2 One Winner will each receive a Free Copy of the book Discovering the It Factor in You.